Blood Orange Rosemary Salmon en Papillote is a simple, yet sophisticated salmon dinner for two, perfect for a romantic date night in or for Valentine’s Day. Gluten-free, dairy-free, nut-free, soy-free. Valentine’s Day is just around the corner, which is why this week I’m sharing exactly what you need to make a sweet, yet simple, dinner (and dessert!) at home for two. Now if going out is your thing – do it! You do you! I know several friends that love the hustle and bustle of Valentine’s Day, the glitz and the glam, and extravagant gestures of love and admiration. But for us? We’re just not as into the scene of reservations, five course menus, roses, jewlery, etc. We’re more introverted (read: no shame in our homebody game!) and truly love a relaxing, quiet evening just us. PSA: If you have food allergies, intolerances, or sensitivities and are going out for Valentine’s Day, try calling the restaurant ahead of time (during off hours – i.e. not during lunch or dinner time) to see what options are appropriate for you and/ or your loved one, or if your needs will be able to be met on such a busy night. 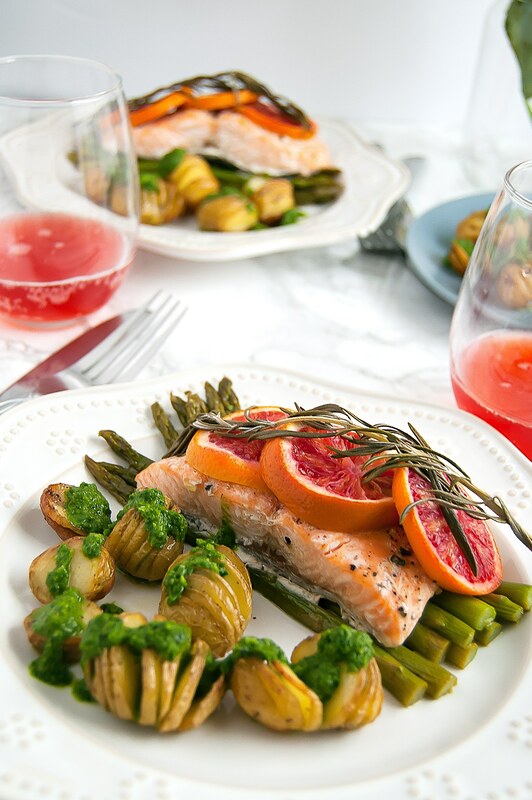 Now if you’re looking for a Valentine’s Day dinner you can make at home, I’ve got you covered with this Blood Orange Rosemary Salmon en Papillote. This year Valentine’s Day is on a weeknight, which means we all need something nice, but lower-maintenance, right? No way am I trying to make beef Wellington, scalloped potatoes, and cheesecake at home on a Wednesday after work during toddler chaos hours! So I decided on simple flavors in one of my favorite easy, yet still seems special dinners: salmon en papillote. Specifically, Blood Orange Rosemary Salmon en Papillote. What does “en papillote” even mean?! Just that the food is cooked and served in a paper wrapper, like parchment paper. Preparing food “en papillote” can actually be a healthier method of food preparation. With the parchment paper creating a little sealed pouch for the Blood Orange Rosemary Salmon en Papillote, it allows steam to build to help cook the food. It’s a much lighter preparation method, especially when compared to methods like basting, frying, or pan-frying where significantly more fat is used in the cooking process. The flavors of the blood orange and rosemary are subtle and add a slight fresh flavor to the salmon. Plus, it’s lower maintenance cooking, too, in that a side dish is built right in! 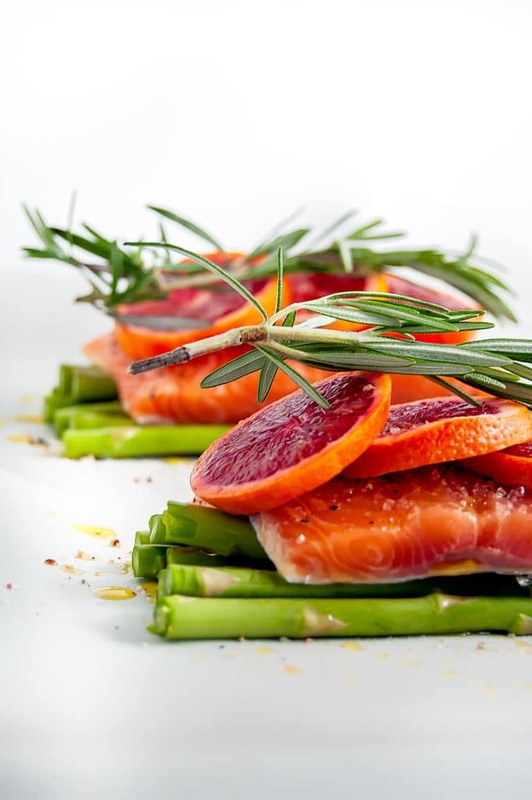 Place the fish on a bed of vegetables, and when the Blood Orange Rosemary Salmon en Papillote is done, you have a side dish ready, too (I used asparagus spears, but other vegetables like broccoli, zucchini, and others work well, too!). You could certainly serve with simple steamed rice or sweet potatoes, but I made these sweet little Hasselback Baby Potatoes with Orange Basil Pesto (recipe coming later this week) to serve with it. Still simple and not crazy complicated, but looks like a slightly more impressive dish to show appreciation to your loved one. 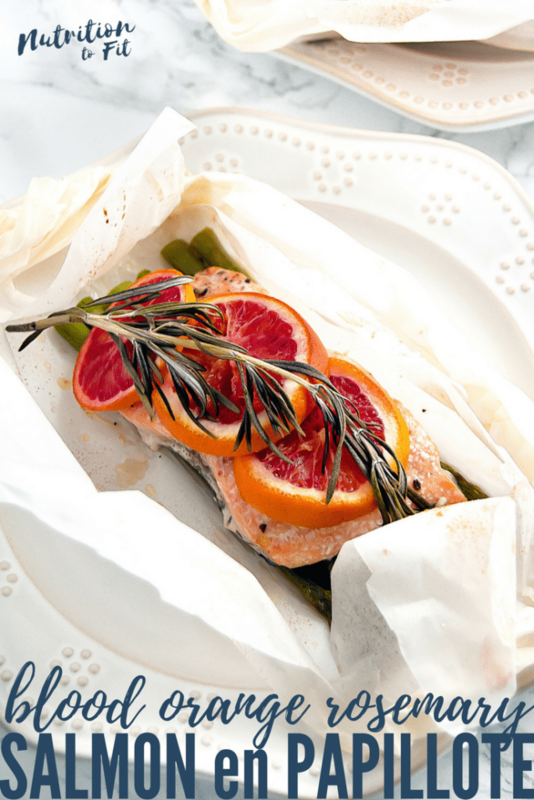 If you try this lovely, simple Blood Orange Rosemary Salmon en Papillote, let us know what you thought! Share your thoughts below in a comment, over on the NTF Facebook page, or share a pic to Instagram (tag @nutritiontofit so I can see it, and use the hashtag #nutritiontofit for everyone to follow along!). You can always send me a DM or email, too! 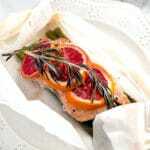 Blood Orange Rosemary Salmon en Papillote is a simple, yet sophisticated salmon dinner for two, perfect for a romantic date night in or for Valentine's Day. Tear off two sections of parchment paper, about 12-18 inches long. 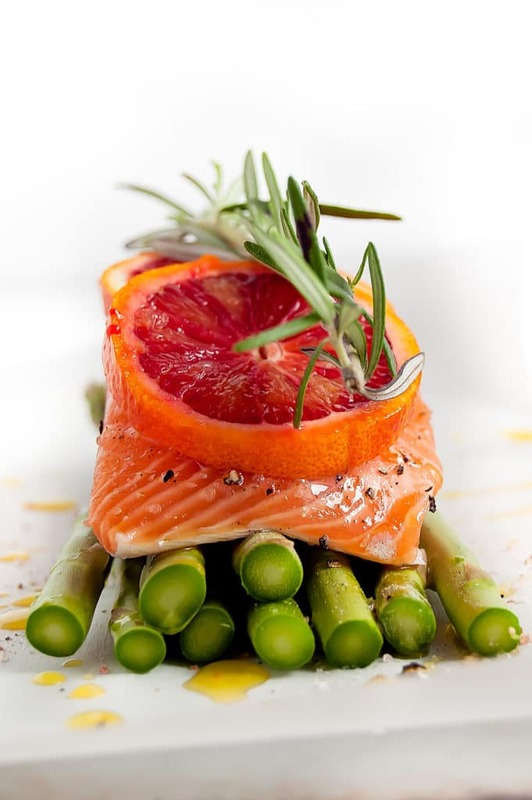 On one half of one piece of parchment paper, place 8-10 asparagus spears and top with a salmon fillet. Drizzle salmon with 1 tsp olive oil, and then sprinkle with salt and pepper. Place blood orange slices and a sprig of rosemary on top of the fish. 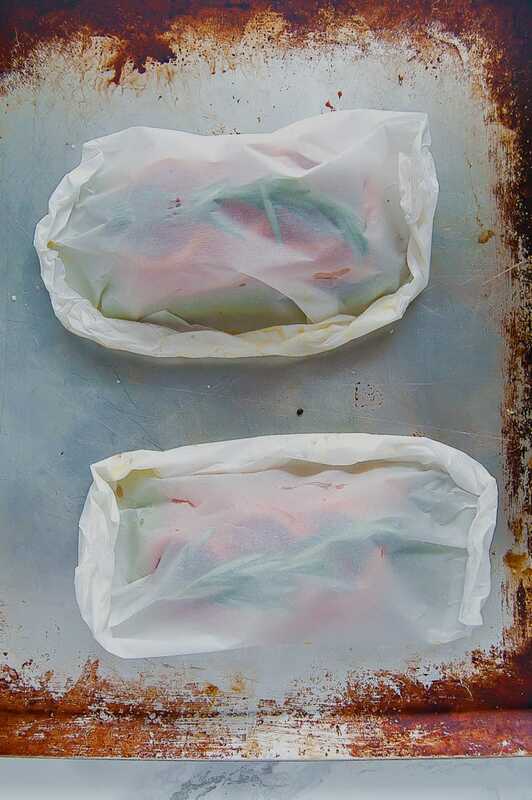 Fold the other half of the parchment paper over the salmon, then fold and pinch the edges together to create an enclosed pocket (see images in post). Repeat with second piece of parchment paper with second salmon fillet. Bake for 16-18 minutes (more time for a thicker piece of fish), then remove and serve immediately. Can substitute any variety of orange for blood orange if you can't find blood oranges.